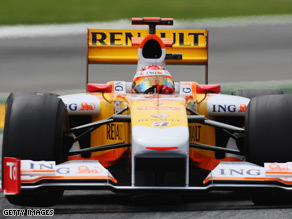 LONDON, England (CNN) -- The Renault F1 team have shown a united front with Ferrari with a threat to boycott the 2010 Championship unless proposed rule changes are dropped by the sport's governing body. The decision comes in the wake of plans by the Federation Internationale de l'Automobile (FIA) to introduce optional cost-caps and technical restrictions for competing teams. Renault stated on their official Web site that the decision by the FIA to introduce two sets of technical regulations has led to the team "reconsidering its entry in next year's World Championship." Renault F1 Team Managing Director, Flavio Briatore said: "We refuse to accept unilateral governance handed out by the FIA. If the decisions announced are not revised, we have no choice but to withdraw ... at the end of 2009." Are Ferrari and Renault right to serve the FIA with an ultimatum? President of the team, Bernard Rey, added: "We remain committed to the sport, however, we cannot be involved in a championship operating with different sets of rules." The controversy centers on plans for an optional cost-capping policy to operate next season which the FIA argued, in an April press release, would allow technical innovation to flourish without promoting a "spending race." It would mean that teams operating within a budget cap of $60 million would be free of technical restrictions, while those over this amount would not. The FIA believed this would attract new teams to join the sport and stated in April "interest has been extraordinarily high from both existing teams and potential new entrants" to the idea. However, Ferrari and Renault fear this will create a two-tier competition with cars in the same race competing under different rules. Renault's announcement comes after Ferrari - the only constructor to have taken part in every season since 1950 - confirmed they would not be entering a team for the 2010 world championships, for the same reasons on May 12. "Ferrari confirms its opposition to the new technical regulations adopted by the FIA and does not intend entering its cars in the 2010 F1 Championship," the team said in a statement on its official Web site. The spotlight now turns to a crunch meeting between the teams and the FIA in London on Friday which will aim to resolve the growing crisis in Formula 1. The furore comes despite F1 boss Bernie Ecclestone telling the Times newspaper that he did not envisage the Italian team carrying through its threat earlier in the week. "Ferrari are not stupid," he said. "They don't want to leave Formula 1 and we don't want to lose them, so we'll get to grips with it."